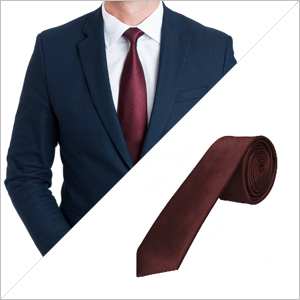 When it comes to weddings – whether you’re attending as a guest, a member of the wedding party or even as the groom – choosing the perfect suit and tie can be a difficult task. 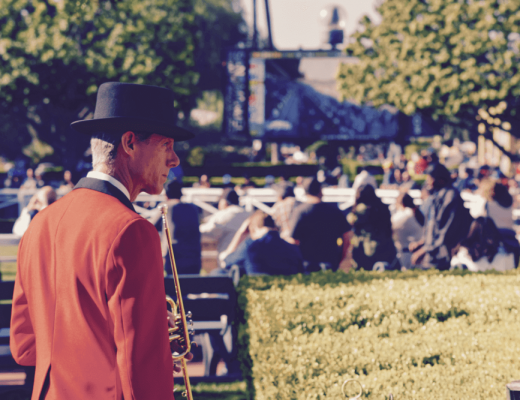 On such a special day you understandably want to look your best, which is why here at TiesRUs we’ve decided to lend a helping hand. 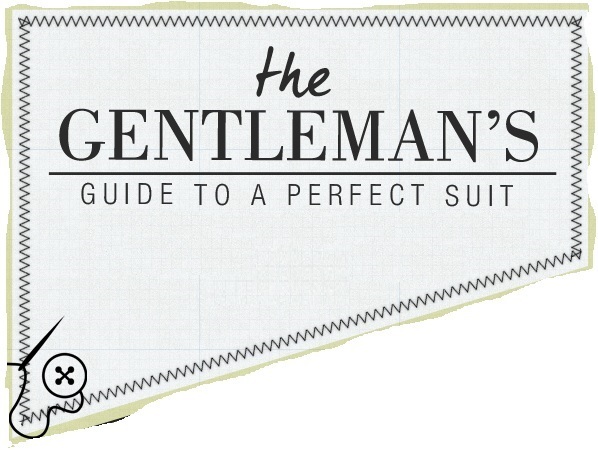 Read on for a helpful guide to all of your wedding suit options, along with the best ties to pair them with on the big day. Grey suits – particularly charcoal grey – make a great, versatile choice. Grey is a colour that is suitable for all year round but works particularly well for a summer wedding. Grey is flattering: it compliments most colours it is paired with and looks good on anybody. 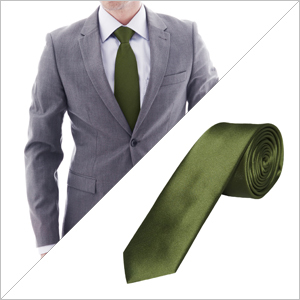 In terms of ties, pastels or earthy tones look great with grey – this leaf green skinny satin tie is perfect. Black is a great, classic option. It is sophisticated, timeless and easy to coordinate. When it comes to accessories, avoid bold colours as this may come across too harsh. Instead, team with a light shirt and waistcoat, and a pastel tie or cravat to soften the look. 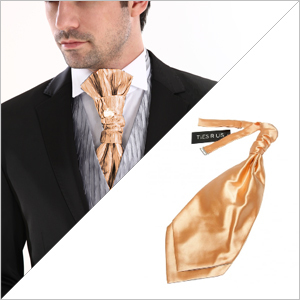 This peach cravat and matching pocket square would work particularly well for a wedding. For something a little different yet still sophisticated, sharp and classic, opt for a navy blue suit. Navy blue is the perfect alternative to black, offering a modern and stylish look whilst still remaining traditional. Navy looks particularly striking with contrasting colours, for example a navy blue suit and waistcoat teamed with a stylish skinny burgundy tie. For a stylish and on-trend colour, opt for a mid blue suit. Mid blue is very in fashion right now, but you have to be careful how you style it in order to keep the look sophisticated. We’d recommend choosing a simple colour palette when it comes to the rest of your outfit, to avoid a colour overload. 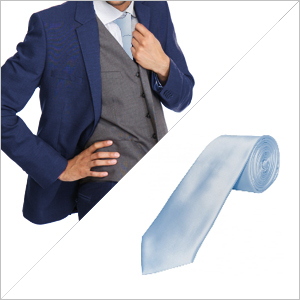 A mid blue suit alongside a subtle grey waistcoat and a pale blue tie is perfect – it is current, coordinated and on-trend, without being too over the top. A brown or tweed suit is great for an outdoor or countryside wedding, and opens up your options when it comes to the rest of your outfit. With brown or tweed you can afford to be a little more adventurous – this is one case where patterned shirts or ties can make an appearance without looking garish. 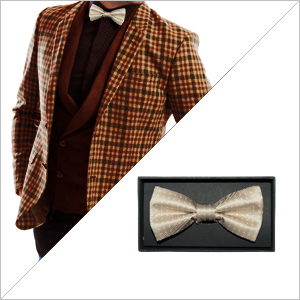 Mix up your look with suspenders or a bow tie – this champagne and white polka dot tie is ideal for a smart and stylish wedding look. Feeling inspired? 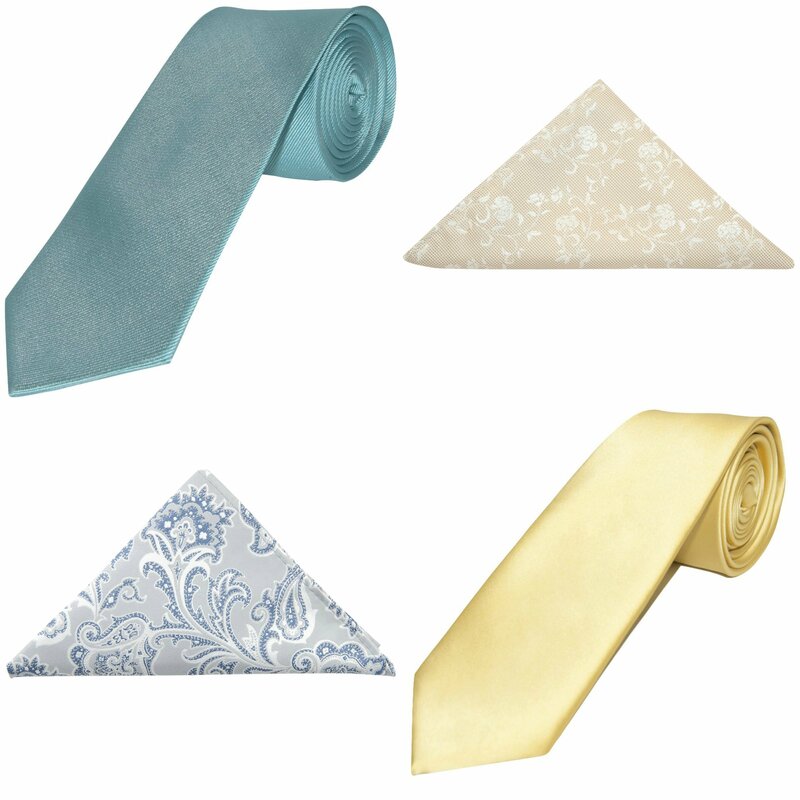 Be sure to check out our full wedding ties collection, for many more high quality and stylish wedding suitable designs.